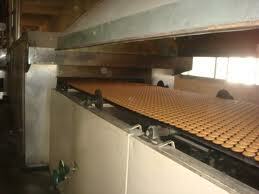 With many investors and foreign players also scouting to enter Indian biscuit market demands for biscuit equipments would definitely rise .Investment in Plant and Machinery varies from Rs 5.0 crores to more than Rs20.0 crores .These capital equipments are custom made and requires lead time varying from 16 weeks to 24 weeks . With such higher number of expansion biscuit equipment manufacturers can expect large orders for biscuit equipments such as Mixers , Ovens , Bulk Handling system , Packing machines, Grinders & Belting . India have flourishing domestic biscuit equipment manufacturing industry with few big equipments manufacturers who can claim to be producing good quality equipments which caters to organised sector of biscuit market ( 25% of total biscuit production is in organised sector ) .Few of them are exporting equipments to African , Middle Eastern Countries , Asian , Eastern European , South American countries . Most of the biscuit manufacturers buy from these domestic equipment manufacturers which provide reliable and low cost equipments in comparison to imported equipments . Main competition for equipment comes from German , American and Taiwanese Equipments .Versatile Biscuit plant which can produce both Hard and Short Dough types are in big demand .Biscuit equipment manufacturers have started providing automation solution with PLC 's and Softwares thus increasing productivity of the plant . Technofour Electronics P Ltd .
CS AEROTHERM in the Bakery Sector with the objective of offering the state of the Art, Digital Baking Ovens for Bakeries in the Hospitality as well as the Bakery Industry. Our products Bread bakery equipment & machines, Bakery machines manufacturers, exporters, suppliers & for restaurants and for hotels in India. Thanks for posting your profile on bakery bazar .We are pleased to have Cs aerotherm as our reader . How to Use Silicone Bakeware. Silicone bakeware is high-tech and easy to store and clean, which makes it an appealing option to many bakers.